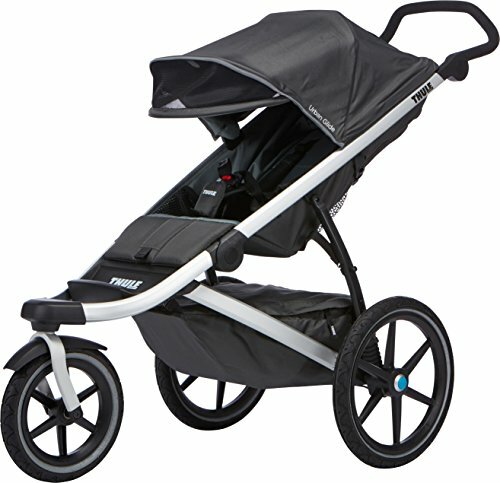 Strollers are heavy and bulky, the opposite of what you need to get back on your running or jogging game after baby. There’s good news for you, however! A lightweight jogging stroller is the answer. Although “light” is relative, a jogging stroller that lessens your load and streamlines the structure can be the difference between never getting your pre-baby strength back and regaining your health. We’ve chosen three strollers we love and answered a few questions you might have about how to choose. 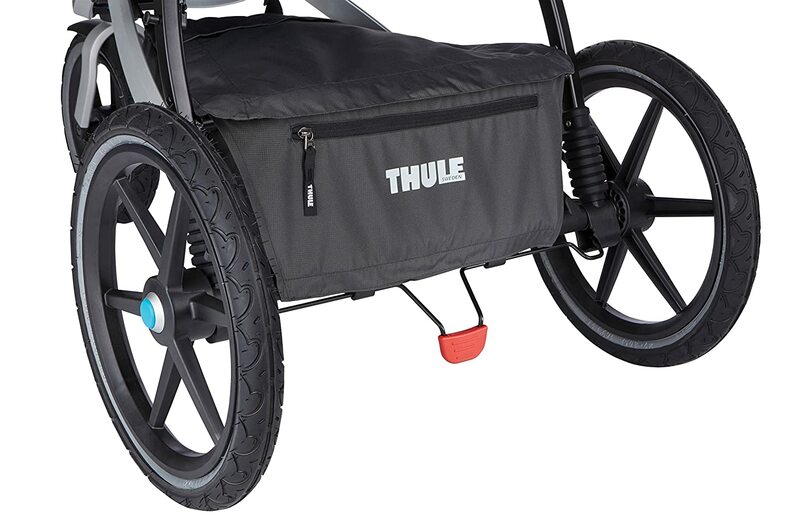 The Thule glide stroller is built for serious runners. It weighs just 23 pounds and has a rear suspension system with larger tires for moms who run on trails. The ergonomic system translates to less power needed to push the stroller, so you spend more time running and less time feeling like you’re pushing a boulder. You can lock the front wheel in place both front and rear facing, or you can set it to free swivel. 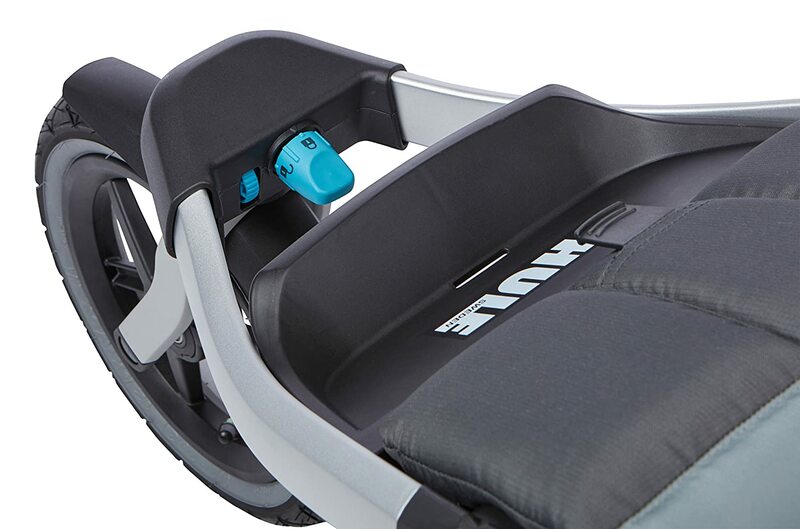 It helps you adjust the tracking, so the stroller is never off even by a little bit. Locked is useful for different types of surfaces, while the free swivel wheel is suitable for maneuverability. It features a one-handed fold, and most people can also lift it with just one hand. It’s slightly lighter than other strollers of the same class, but it’s very streamlined. It has a max weight limit of 75 pounds. The ergonomics prevents the added weight from adding too much extra resistance when pushing. The suspension system makes it a comfortable ride for kids, a blessing for moms who run long distances and have to contend with fussy kids. It has an enormous storage area underneath that’s covered completely. The back peekaboo window lets your child see you, and you can check on your child without disturbing them or halting your run. The seat reclines nearly flat with a one-handed control. One downside is the brake system is a little bulky and requires a lot of force to engage. The wrist strap is too short to switch hands easily, something serious runners might find a dealbreaker. The Bob Revolution SE is built for off-road terrain. It handles well on smooth surfaces, but it shines on rough trails. It has a sizeable rear suspension system and tires to handle any inconsistent ground. The tires are air-filled rather than rubber for added comfort, both for the passenger and the runner. 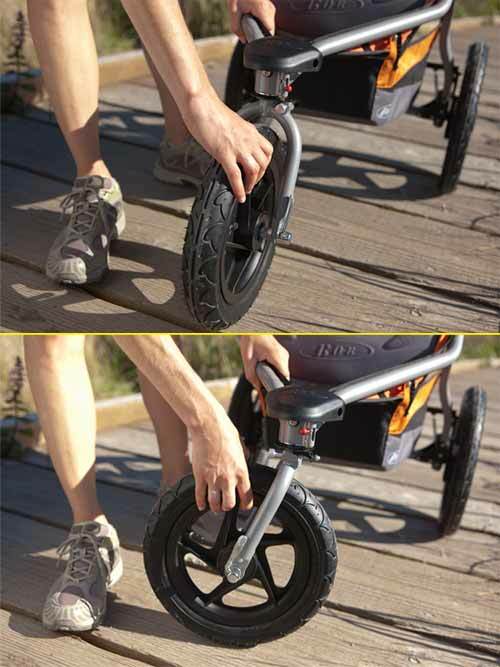 You can lock the front tire into place for stability on rough terrain, but when you have to take the stroller on errands, you can set it to swivel to maneuver better. It can do a 360-degree turn with very little space. You can adjust the suspension to account for your child’s height and weight, plus the surface. It’s a very smooth ride that requires little pushing on your part and helps keep your child comfortable. It has a deep seat that reclines nearly flat and accommodates up to 75 pounds. 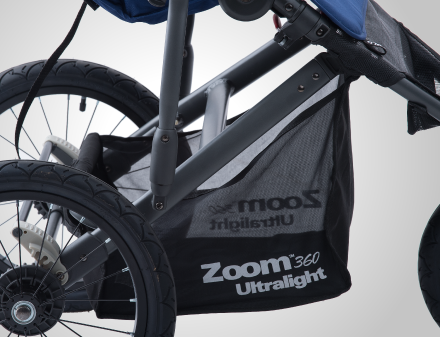 The extendable canopy has five different positions, and there’s a peekaboo window so you can see your child through the entire run. The reclining system uses straps, so you can’t adjust one-handed. The wrist strap is long enough to switch hands with minimal fuss. There’s a large storage compartment underneath that zips closed. Folding it up is a two-step process that requires both hands, so this isn’t going to be an errand stroller. We’d like to see a more manageable system for folding. Folding it is a headache. Do you need to know more about the Revolution SE? the video review below can help you! 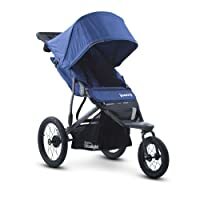 Joovy’s jogging stroller is a more affordable option for parents who need some essential jogging features and don’t plan to do much long distance jogging or running. It has a rear suspension system that minimizes impact to the rider and the jogger. The seat could use more padding, but the air filled tires (and included pump) help offset that issue. It has a locking front wheel for stability and a free swivel option for maneuverability. It lacks the tracking system of some of the more expensive strollers, meaning that it’s difficult to get a wheel position that doesn’t pull to one side. If you don’t do long distance running, you may not notice. It’s easy to push on hard surfaces, but the handlebars don’t adjust for different heights. The braking system is easy to use. The seat could be more padded, and the recline relies on a strap system. It’s not quick, but it does allow for closer customization. One major drawback is the folding system. It’s just not intuitive. You’ll probably have to watch a video to master the multistep process (folding Instructions in the video below), but it folds surprisingly flat for a jogging stroller with such large wheels. It does offer storage below, but it’s smaller than the other two strollers on the list. It does have mesh pockets, and the parent console comes standard with the stroller. Jogging stroller wheels should be larger than average stroller wheels. Wheels should be between a minimum of 12 inches to 24 inches. The larger the wheel, the easier it is to push across multiple types of surfaces without much resistance. Jogging strollers come in a three-wheel design that focuses on forward motion. Many of them are air-filled instead of hard rubber or plastic. While it does make punctures a concern, the stroller moves more like a bicycle over the surface, so you get less tired from pushing. 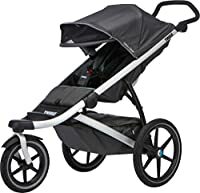 Serious runners look for wheels that can lock into place (with a tracking system, so the stroller doesn’t pull in either direction) or can swivel to maneuver through tight spaces. An excellent rear suspension is critical if you plan to run over anything besides a smooth hardtop surface. Without suspension, the full impact of every surface imperfection vibrates to your body and your child. 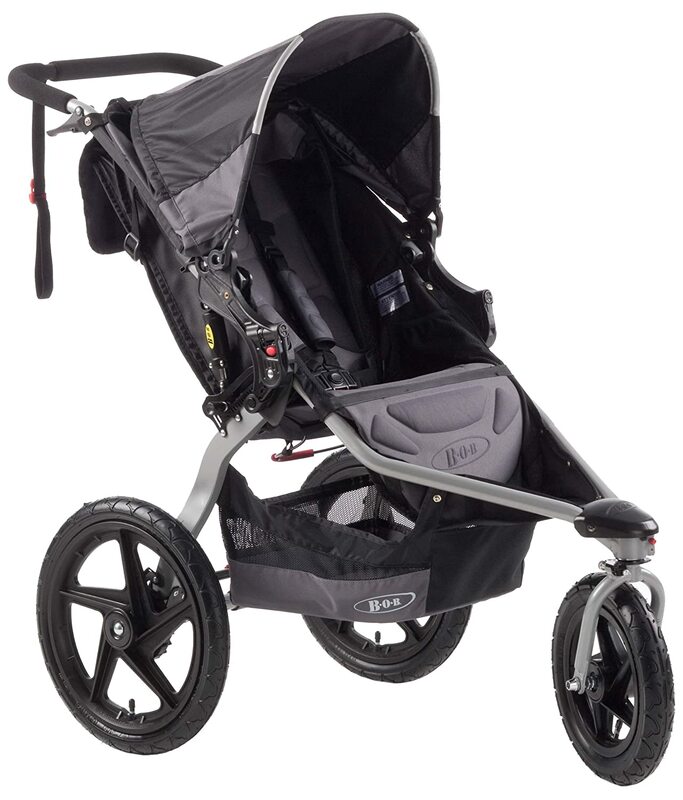 Serious running strollers have a suspension system that’s adjustable. You have a lot more control over how the stroller rides for lighter and heavier kids, plus more difficult surfaces. If your central jogging location is a difficult trail, you’ll thank yourself for this control later. There are two types of braking systems. Foot brakes are those that keep a stroller from moving while you’re stopped to rest. As soon as you stop moving, engage the brake to keep the stroller from rolling away. Some fixed wheel strollers have a handbrake that’s convenient for controlling speed. When you’re jogging downhill, for instance, you can prevent the stroller from pulling you along until you get caught up on flat ground. A wrist strap is essential for keeping the stroller from getting away from you. The strap should be long enough to allow you to switch hands during a run without too much fuss, but short enough that it never lets your stroller get away from you. Storage is a good option although runners might not need the same amount of room as errand runners. You need enough to hold your water and some necessary supplies for your child. If you use your stroller as your main stroller, having a more substantial compartment might be a better option. Some canopies have peekaboo windows on the back. These are great for keeping an eye on your child without having to pause your run every five minutes. Some also come with a parent console and adjustable handlebars for the best customization. You can set the height and angle of the bars for comfort during your run, and have an easily accessible water holder, plus other minor accessories without carrying them. 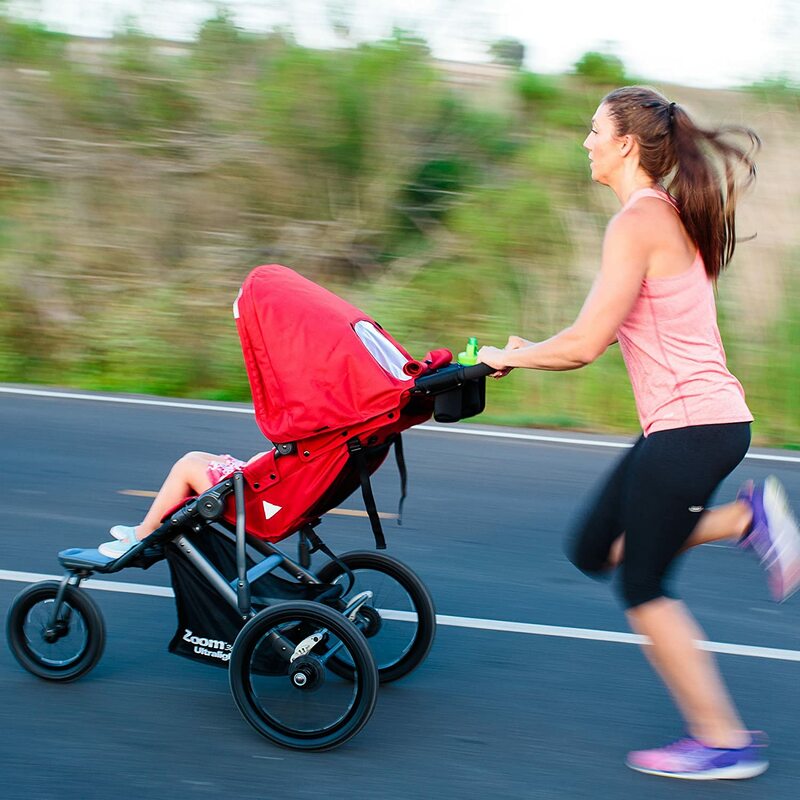 Whether you’re a serious runner looking to get back into the game, or someone who’s resolved to improve your fitness, a good lightweight jogging stroller can be the first step to fulfilling your goals. What kind of runner are you? Casual? Expert? Let us know in the comments below. Photo & Video credits: Amazon, Baby Gizmo, ExcelDriveVideo, BabyRun Ireland, Header Photo From BOB.